Schmalkalden is a small "city" with about 20.000 inhabitants smack in the exact middle of Germany (also known as "the (very pretty) sticks"). 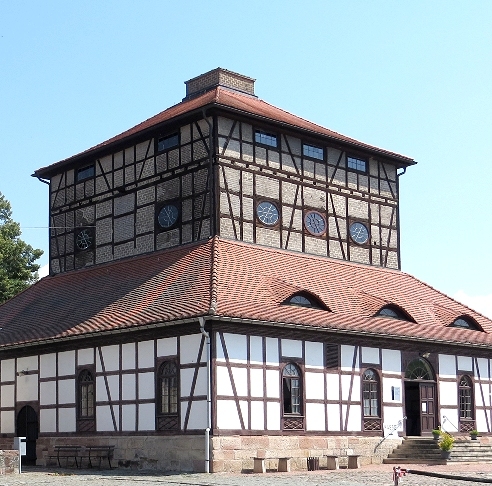 It boasts "Wilhelmsburg Castle", the former residence of the Hessian landgraves (sort of dukes), built about 1590 and containing interesting things. Its claim to fame comes from the Schmalkaldic League, a historically important military alliance, founded in 1531 by "early" Protestant princes, for protecting religious and political interests within their domains. The area has a long standing history of mining, metal smelting and metal working, going back to at least 1300. The guns made in nearby Suhl, for example, have been world-famous for quite some time. Close to Schmalkalden is the "Neue Hütte" (New Smelter), now an open-air museum. 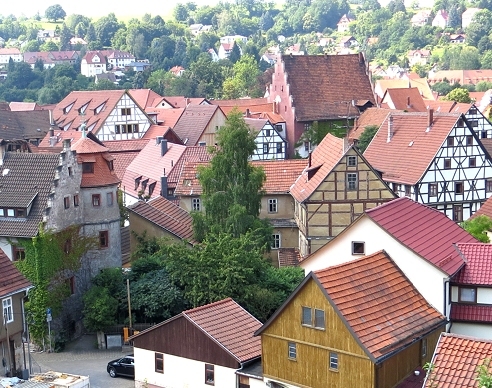 Parts of Schmalkalden today as seen from the castle. The building housing the smelter. A model of building and smelter. Note that the narrowing of the cross-section above the reaction zone provides for some mechanical support of the fuel / flux / ore filling by friction and some mixing of the contents by "folding". Around 1900 the rest of the world had been using coke for quite some time, but Schmalkalden stuck to charcoal. Charcoal is more reactive than coke and thus offers certain advantages for smelting but supply relies on the wood available, and forests near a major smelter will be depleted soon enough. Transportation of charcoal over long distances is not very economical since it has a low density, and transport costs typically scale with the volume, not the weight. In antiquity it was thus easier to move the (small) smelters to a new woody area than to transport charcoal for distances larger than about 10 km. The Schmalkalden smelter, however, like all smelters just a few hundred years old, was tied to its source of energy: a waterwheel supplying the power for blowing enough air into the tuyeres. In addition, you needed the ore and that was mined in the general region. Somehow, albeit with large difficulties, the supply of charcoal was kept up until less than a hundred years ago. I guess it was either charcoal or closing down the whole industry because transportation of coke from (far away) coal mining areas would have been too costly. 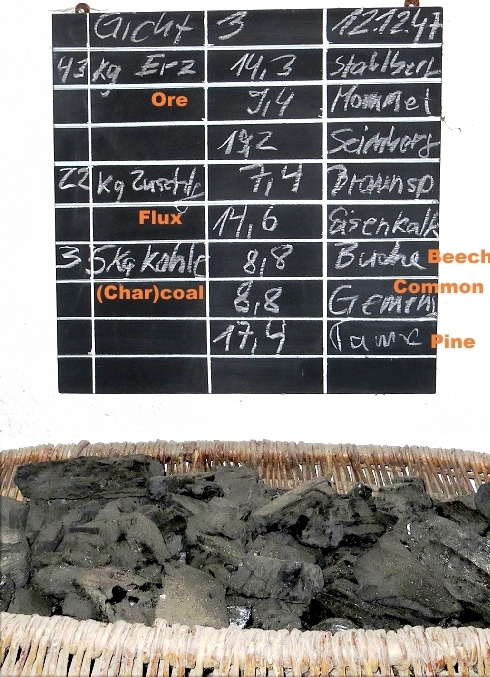 43 kg of ore from three different locations (...berg = ...mountain). 22 kg of flux with 7.4 kg "Braunspat" (brown spar) and 14.6 kg of "Eisenkalk". Both names refer essentially to variants of siderite or iron carbonate (FeCO3), a mineral where substantial amounts of iron atoms can be replaced by others, like manganese, (Mn), calcium (Ca) or magnesium (Mg). "Braunspat" typically means calcium-rich siderite, properly called "ankerite" (CaFe[CO3]2). "Eisenkalk" is also a synonym for siderite but probably meant some special variety. 35 kg charcoal, a mix of 8.8 kg beech and mixed or common stuff, and 17.4 kg of pine. That makes for a total of 110 kg for one "feeding" of burden. Note that the numbers are precise to 1 % and that the composition was defined by weight and not by volume as had been the custom for millennia. Power of water wheel: 30 kW; akin to 250 hard-working people. Air supply: 0.44 m3/s. Guessing a cross-sections at tuyere level of 3 m2, that makes for a space velocity of 0.15 m/s or 9 m/min, which is about right for a furnace of this size. This is a rather peculiar iron. Very rich in Manganese (Mn) and with a carbon concentration that is relatively low for cast-iron. It might have been well-suited (after some fining in order to reduce the carbon content somewhat) for the production of tools like hammer heads, drill bits, screw driver blades, wrenches etc., a major local industry needing particularly hard steel, or for casting oven parts.